A robotic mowercuts more frequently than a conventional mower, and the grass clippings go straight back into the lawn as a valuable fertiliser. The result is a perfect lawn with no clippings to dispose of and no trace of them left on the grass. A tidy-up lap around the boundary keeps all the edges neat. Designed for comfort, convenience and performance, John Deere lawn tractors offer the ultimate experience in grass maintenance. All John Deere Select Series models are engineered to the highest quality standards, with a heavy-duty robotically welded frame, powerful fuel-efficient engine and high-precision cutting technology. The new X350R lawn tractor will particularly suit customers with areas of grass up to 8000m2, or about two acres. It is simple to operate, with easy-to-use foot pedals, a modern car-style instrument display and a powerful 12.2kW/3100rpm Kawasaki petrol engine with cruise control. The X350R features a new 107cm (42in) rear discharge Accel Deep mower deck, designed with a deep body and flat top to allow a clean flow of grass cuttings for excellent cut quality, even in normally difficult tall grass. The stamped steel design of the durable heavy-duty deck eliminates sharp edges and corners where material can build up and compromise performance. The new Accel Deep deck ensures a premium finish, as well as many hours of trouble free operation. Height of cut is easily adjustable from 25 to 102mm (1 to 4in) in 6mm (¼in) increments, using a dial – all from the comfort of the lawn tractor’s deluxe seat. An adjustable fill switch for the grass collector activates an indicator and alarm, so that the operator can choose when to empty the machine. The high capacity 300-litre collector means faster work with fewer stops to empty the clippings, which is also quickly done from the operator’s seat. An optional mulching kit makes the X350R a truly versatile machine. For additional year-round versatility, a wide range of front and rear-mounted attachments and implements can be used with the X350R, including utility carts, a rotary brush, front blade and snow blower. 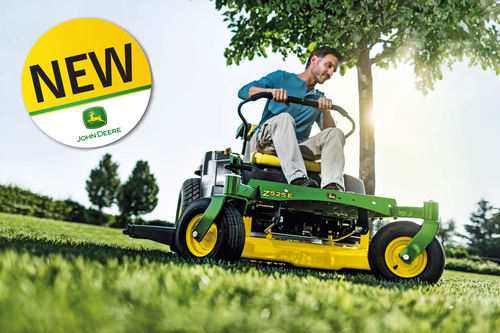 All the models in John Deere’s X300 and X500 Select Series lawn tractor range introduced for 2016 come with multiple improvements, such as the new mower deck, an updated instrument display with the look and feel of a modern car and easy to operate controls. The lawn tractor’s ‘best cut zone’ feature enables the operator to always run the machine at its optimum speed and still maintain great cut quality. An optional MulchControl attachment means changing from side discharge to mulching or vice versa is done with the simple flip of a lever. John Deere’s new walk-behind mowers for 2016 offer a wide choice of size, power and high performance features across the company’s extensive range. Updates introduced this year make the machines even more versatile and simpler to operate. The C52KS and R54RKB models are now powered by a Subaru engine, resulting in high performance in tough mowing conditions, improved operation including easier starting and great reliability. Suitable for mowing areas up to 2500m2, the R54RKB has a steel rear roller for a striped finish, variable speed, 54cm (21in) cutting width, Blade Brake Clutch, a robust cast aluminium deck and TurboStar fan-assisted mowing system to ensure a precision cut and efficient collection. In addition, the driveline of the R54RKB rear roller mower has been completely revised to increase its ease of use and durability. New sealing and drive components have undergone rigorous testing to ensure enhanced reliability. The C52KS walk-behind mower now features a variable-speed drive, enabling the operator to cut or even mulch at the optimum speed (a mulching kit is optional). With a choice of speed ranges from 2.9 to 4.8kph, the C52KS easily adapts to all grass conditions. The improved transmission also provides smoother engagement and greater durability.The ergonomically designed soft-touch handlebar results in lower vibrations, which reduces pressure-related hand fatigue. The foldable handlebar, already familiar from the PRO 47V mower, makes transport and storage much easier.